Arrival of delegates to the congress. Delegates in the back seat of the car. Delegates go to the meeting of the congress in the Grand Kremlin Palace. 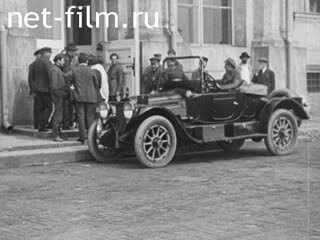 Delegates to the congress at the entrance to the palace, arrives at the car. Checking the credentials of delegates entering the palace. Delegates pass through one of the corridors of the palace. Delegates on the sidelines talk to each other before the opening of the congress, among them - Kon FY, Tskhakaya MG, Litvinov MM, Rudzutak Ya.E. Military delegates are talking to each other. Delegates in the hall before the first meeting. 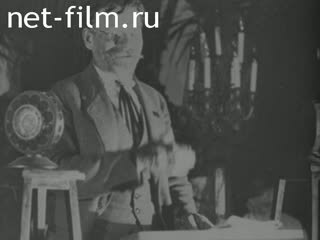 Kamenev LB, standing in the presidium, opens the congress, Lashevich MM sits next to him. General view of the presidium of the Congress, Kamenev continues his speech, the delegates in the hall applaud. Speaker Rykov AI, the general view of the meeting hall. A representative of the non-party miners of Siberia is speaking from the rostrum. Representatives of workers' delegations speak with greetings to the Congress. A gift to the congress from one of the workers' delegations. 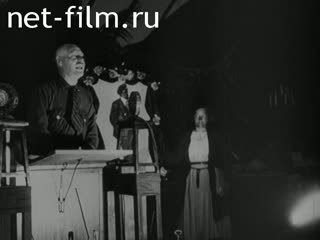 Comrade Alekseev, the Communist of the Leninist call, and the delegates in the audience applauded. Representatives of other workers' delegations. Kaganovich LM Speaks at the 13th Congress of the RCP (B.) With the report of the credentials committee, delegates in the hall listen to his speech. Speaker Kamenev LB, delegates listen to his speech. Representatives of working delegations speak. One delegation presents the gift to the congress, the head of the delegation gives a speech. Delegations of female workers welcome the congress, hand over the banners from the collectives of industrial enterprises to the congress. Zinoviev G.E. Stands from the rostrum with the final word. A solemn event at the Khodynka Field in honor of the 13th Congress of the RCP (B. ), Is a column of participants of the rally. The column is passing by the truck, on the platform among the leaders is Budenny SM. The participants of the rally carry placards and banners with slogans. General view of the presidium of the 13th Congress of the RCP (B.). Kalinin M.I. Speaking with a report on the work in the village, delegates in the hall listen to his speech, applaud. Krupskaya N.K. Stands from the rostrum, the delegates applaud her. General view of the presidium of the congress. Komsomol activist Shokhin AP Speaks from the rostrum. A representative of the delegation of educators Maslov greets the congress from the rostrum. Zinoviev G.E. Speaks with a return speech. Demonstration and meeting of educators on Red Square with greetings to the 13th Congress of the RCP (B.). Lunacharsky AV, Petrovsky GI Act from the rostrum of the mausoleum, participants of the meeting listen to the speakers. A column of educators and Komsomol members is walking along one of the streets of Moscow. Panorama of part of Moscow from the balcony of the Grand Kremlin Palace. Voroshilov K.E. Among delegates to the congress. Delegates of the congress are talking on the sidelines. Molotov V.M. Speaks from the rostrum. Delegates to the congress in the corridors of the Grand Kremlin Palace. Kaganovich LM Speaks with the report of the credentials committee, delegates listen to his speech. A column of cavalry passes. General view of part of the Khodynka Field during the solemn event in honor of the 13th Congress of the RCP (B.). Red Army men in cordon near a wooden airfield tower. The arrival of Leon Trotsky. Trotsky, accompanied by Frunze MV And members of the Revolutionary Military Council of the USSR bypasses the Red Army. Kamenev S.S. Speaks with a speech. People listen to Kamenev's speech, standing and lying on the grass. Trotsky rises to the platform of the truck, the rally participants applaud him. Trotsky speaks at the rally, the cameraman is filming. The operator finishes filming, Trotsky descends from the truck, the rally participants applaud. At the rally stands Kalinin, next to him is Voroshilov. Speaker Lashevich MM, those present applaud him. The rally participants applaud the speakers. Speakers give the command of the Soviet Air Force congratulatory addresses.